Gaiam’s Organic Cotton Yoga Strap is made from 100 percent organic cotton, grown without the use or chemicals, pesticides, or fertilizers, and measures out to 8 feet. Use of a yoga strap makes difficult poses more accessible to everyone no matter their skill level. The strap helps you grasp limbs and deepen stretches so you can achieve stretches and hit poses you wouldn’t be able to without a strap. For advanced yoga practitioners, a strap can aid in even deeper stretches. A unique easy-release buckle holds strap securely in place. Experience the mind-body satisfaction of flexing beyond your usual limits with a strap made of 100% organic cotton. This extending strap allows you to expand your range, achieve more challenging positions and sustain poses for longer periods of time. 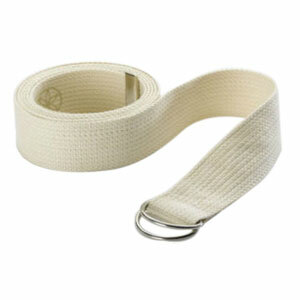 This strap measures 8 feet long and 1.5 inches wide.